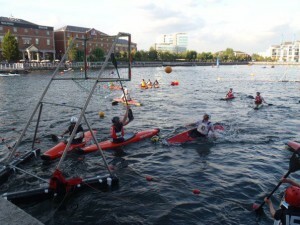 Situated in the regenerated area of Salford Quays, Salford Watersports Centre is one of the home venues for Manchester Wildcatz canoe polo club. Surrounded by museums, shopping centres, hotels and near to Old Trafford stadium, Salford Quays provides a fantastic opportunity to showcase canoe polo to the passing public. The Watersports Centre building itself is well equiped with warm showers, bookable meeting rooms and refreshments. There is water space for 4 or more pitches, open water for warming up and ample room for spectators along the quay side. Please click here for the Salford Quays Venue Guide pdf, containing directions to Salford Quays, parking and venue use arrangements, plus directions to local shops and eateries. Please see the attached document with final details of the proposed NWC Youth development and league. ©2015 NWC Canoe Polo Committee by Matt Carter. To report a problem, please email us.